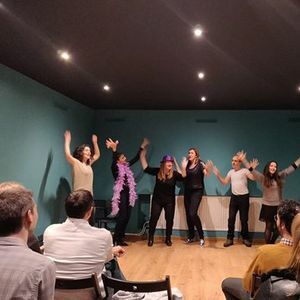 This is not only our 3rd ImproBubble jam, but also a party to celebrate Kelly's end of having a 'normal job' / double life existence and the beginning of being a full time improviser! So expect lots of booze and games as well as guest appearances from ex-colleagues who have been so supportive, she thought they should get a chance to see why she's leaving (and maybe even get to play along!). We will have a guest performance from the talented The Wrong Idea, and the evening will be hosted by the lovely Natasa Papan, so get in touch with her if you have a perfornance or game request!